The City has been recognized internationally with a 2018 Energy Vision Leadership Award for its innovative renewable natural gas project. The City of Toronto, in partnership with Enbridge Gas Inc., will begin installing new biogas upgrading equipment at the Dufferin Solid Waste Management Facility in 2019. 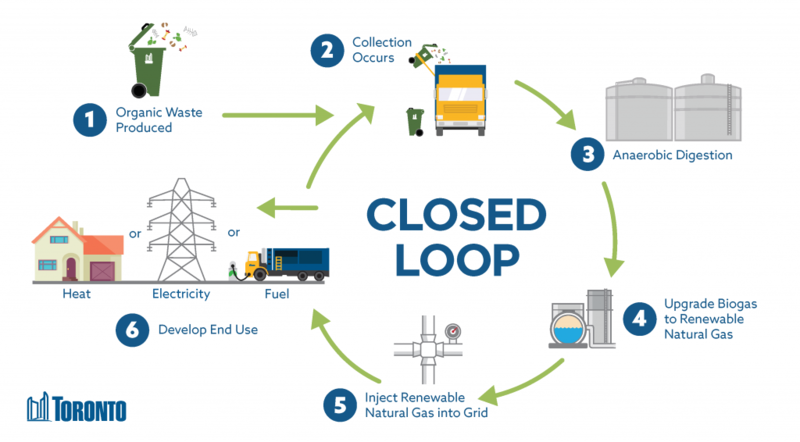 The new technology will allow the City and Enbridge to transform the biogas produced from processing Toronto’s Green Bin organic waste into renewable natural gas (RNG) and inject that gas into the natural gas grid. Once in the grid, the City will be able to use the RNG to fuel its collection trucks. This project is one of the first of its kind in Canada and North America and will allow the City to reduce fuel costs for its fleet of collection trucks and significantly reduce its carbon footprint. Current estimates suggest that the Dufferin RNG facility will produce approximately 3.2 million cubic metres of RNG per year – enough to power the majority of the City’s solid waste collection fleet. The project supports the City’s Long Term Waste Management Strategy and move toward a circular economy by using a closed-loop approach where organics collection trucks can ultimately be powered by the waste product they collect. This is the first of four waste-to-RNG production opportunities identified by the City. Circular model showing how waste can ultimately be used to create green energy.